AP-86-42867F man going right self-adhesive 5-3/4" x 5-3/4"
AP-86-42887F man going right self-adhesive 7-7/8" x 7-7/8"
AP-86-42947F man going left self-adhesive 5-3/4" x 5-3/4"
AP-86-42967F man going left self-adhesive 7-7/8" x 7-7/8"
AP-86-43027F straight arrow self-adhesive 5-3/4" x 5-3/4"
AP-86-43047F straight arrow self-adhesive 7-7/8" x 7-7/8"
AP-86-43107F diagonal arrow self-adhesive 5-3/4" x 5-3/4"
AP-86-43127F diagonal arrow self-adhesive 7-7/8" x 7-7/8"
These standards require that all public buildings for business, education, medical institutions, hotels, motels, retail and assembly locations have luminescent emergency markings for evacuation. This standard applies to occupied floors more than 75 feet above the lowest fire department vehicle access point. 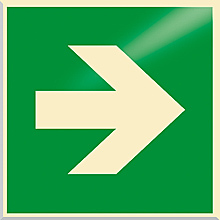 These special egress markings are to be placed in all exit path points such as steps, landings, handrails, perimeters lines, on obstacles and door frames at exit points. Enforcement occurs through building inspectors and fire code officials.